Has anyone heard of U.S. laws affecting interior colors? I'm in the color selection process as well (for a European Delivery E320 CDI), and had an interesting visit with the dealer yesterday. On the phone, I mentioned that I wanted to see what Platinum Blue looked like, on any body style (there were no vehicles available on my first visit). He immediately mentioned that there were color issues that merited some serious thought, and the word "checkerboard" was mentioned. I wasn't quite sure what he meant until we went out to the lot and showed me some things that are probably unique to the U.S. market. The upshot of all this is that the Ash and Stone Interiors have a darker trim band than the rest of the interior at the window "sills" and some other spots. I realized that this was exactly the inconsistency that had been bothering me with both the Ash and Stone interiors despite my fondness for them, but that I couldn't quite put my finger on previously. He also pointed out that there are slight window tints that match the interior colors. The windows of Stone interior cars seem to have a slight bronze cast, whereas the Ash interiors have a silver cast to the windows. I was hoping to find a blue that was somewhere between the Platinum Blue on the light side and the Capri blue (which can look almost too purple if the light is right.) I think the Platinum Blue is a class act, but I'm always terrified that the nice blue of one year will end up being like the Honda "Seafoam Green" as time goes on. That is, a color so completely at odds with the rest of the traffic on the road that the car sticks out like a sore thumb. Between my concerns about keeping up the appearance of the interior and the long-term "fashionability" of blue hues, I'm leaning toward pewter/charcoal. The pewter really seems to hide pollen/dirt. I wanted a blue car, but I'm not at all sure that Platinum Blue/Charcoal would look all that great. If anyone has that combination, I'd love to hear your thoughts. One vote for charcoal - it really seems to bring out the wood's character to a degree I didn't really see with Stone or Ash. This seemed a little surprising to me, given that those background colors are lighter, and I would expect the contrast to highlight the wood trim. I think Stone is probably more complimentary than Ash to the walnut, but as a devotee of pretty wood (my grandfather used to build harpsichords), there's something to be said for providing a subdued background against which it can stand out. i was dead set against charcoal originally, due to concerns about heat. The removal of the solar panel from the options list hasn't made the analysis any easier. Sorry if this is rambling. 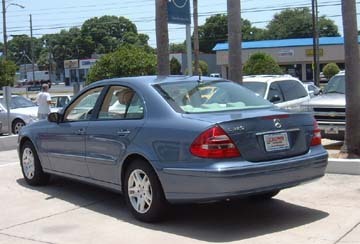 I really want to get this car ordered, but my goal is to live with it for a long time. It appears that my 1987 300E is going to need significant work (at 210000 miles), so my European Delivery plans have accelerated more rapidly than I would have ever expected. Have you considered looking at the range of Designio blue colours? Unfortunately, the stodgy U.S. versions don't offer them. The Designo colors are a "Silver", which is really a straight champagne gold, "Mocha Black" and "Graphite". It's enough to make a guy want a "grey market" car...no pun intended. For my taste, the "black" wood is stained too dar, and doesn't look like wood to me but looks like a plastic insert. 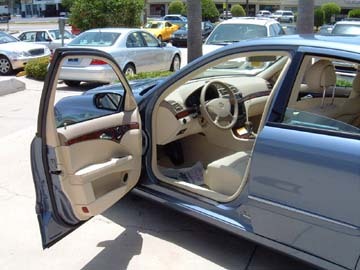 Thats why I went with the "brown" wood & couldnt get the '04 sports pkg, which only came w/ black wood. I wanted to see what Platinum Blue looked like, on any body style. It took me about 2 months to find Platinum Blue/Stone at a dealer. I wanted to see the combo before ordering. I hope these photos help. The optional wood wheel makes a very positive improvement IMHO. Thank you very much! Your photos are definitely helpful as I could only find Platinum Blue/Ash at the dealer. I saw Granite Gray - it almost looks like a "cadet blue". The Granite Grey changes appearance depending on the ambient light and reflected light it might pick up such as from trees. It takes a nice, deep shine from NXT and is definitely different from all the blacks and silvers which are out there. I've been very happy with my choice but I would have been sorely tempted by the Platinum Blue if I had seen one before ordering mine. I have come to the conclusion that my desire for a one-colored dash/interior will probably only allow me to choose Charcoal. I've begun working things around that and I think it's down to Pewter and Granite Grey for me. I confess to being intrigued by the paint chip for "Flint Gray". My dealer has never seen Flint Grey, and understandably won't order a color he's never seen. The one thing that is obvious is that Pewter makes dirt all but invisible. I was amazed at the degree of cruft that the Pewter would "cover up." Let me know if you want to see the GraniteGrey/Charcoal combination. I live in Arlington and work in Tysons. I LOVE my ash interior, it is, in my opinion, absolutely refreshing. As far as keeping it clean, it shows dirt. Just imagine how dirty your charcoal interior is and you don't even see it. At least with Ash, you see the dirt and remove it, and drive around in a car you KNOW is crisp and clean, versus wondering, with darker interiors. BTW I strongly recommend MB parts-counter all-weather mats, in BLACK, with the ash interior, it sets off a nice match with the dark dash top, and you don't have to be paranoid about dirt on the floormats. Plus, the all-weather mats cover the carpeted dead-pedal. Last edited by cdiken; 09-27-2004 at 09:27 PM. Dont know where you live, but do the all weather rubber mats allow winter melted snow to run off them & onto the car's carpet?.. At least the carpeted mats absorb & keep all the run-off. Nothing gets to the floor. The carpeted mats should have covered the dead pedal, though. Or someone should come out with a color matched plastic dead pedal to cover that area. Barry, I also wish that someone would come out with a dead pedal cover. I'd buy it in a hearbeat. I was concerned with the Ash interior myself, but it is not horrible to keep clean. A little Zaino and you'll be all set with the leather. And, get some charcoal floor mats, and it creates a nice contrast on the inside of the car. Well, after a surprisingly difficult process, my order is in. It was a tight race between Granite Grey and Pewter, but Pewter won out in the end. My '87 300E almost killed me at an intersection this morning. I hit the pedal and the car moved 1/3 into the flow of traffic and balked. I think she knows her days are numbered. I hope I can survive until around January when the new one finally gets back here after we meet in Europe in November. Ok..Replacement for Conti's... Sound Off!! Quick Reply: Color Combo Decision HELP!